Israel has intensified its crippling blockade of the Gaza Strip by closing the only crossing for commercial goods. Former Gaza health minister Dr. Basem Naim discusses the impact on a devastated health system and says that Palestinians will continue their weekly protests for freedom. AARON MATE: It’s The Real News. I’m Aaron Mate. As mass Palestinian protests enter their fourth month, Israel is intensifying its already-crippling blockade of the Gaza Strip. Prime Minister Benjamin Netanyahu says Israel will close Kerem Shalom, the only crossing for commercial goods into Gaza. This will ban all imports and exports on top of the sweeping besiegement already in place. Israel is also reducing the fishing zone for Gazans off the Mediterranean coast to just six miles out, down from nine. More actions are said to be coming. This comes as Israeli forces continue to open fire on Palestinians taking part in the Great March of Return. The Gaza Health Ministry says that overall, 136 Palestinians have been killed, and more than 15600 injured. Israeli forces killed at least one Palestinian and wounded nearly 400 on Friday. The blockade and casualties have overwhelmed Gaza’s crippled healthcare system, which the UN warns is already at a breaking point. Joining me from Gaza is Dr. Basem Naim, former Minister of Health in Gaza. Welcome, Dr. Naim. Let me start by asking you, how will this intensification of the already-crippling blockade of Gaza impact its people? DR. BASEM NAIM: You know that Gaza is under Israeli siege for more than 12 years now, and the borders are nearly totally blocked and controlled by Israel. It means that this is a new step in accelerating the humanitarian catastrophe in Gaza, and it will increase the need in all aspects and at all levels, not only in the health system. Health system, Social Affairs, and all the needs of Gazans. I think this will be a step towards increasing the catastrophe in Gaza. AARON MATE: And what is the state of the health system right now in Gaza? 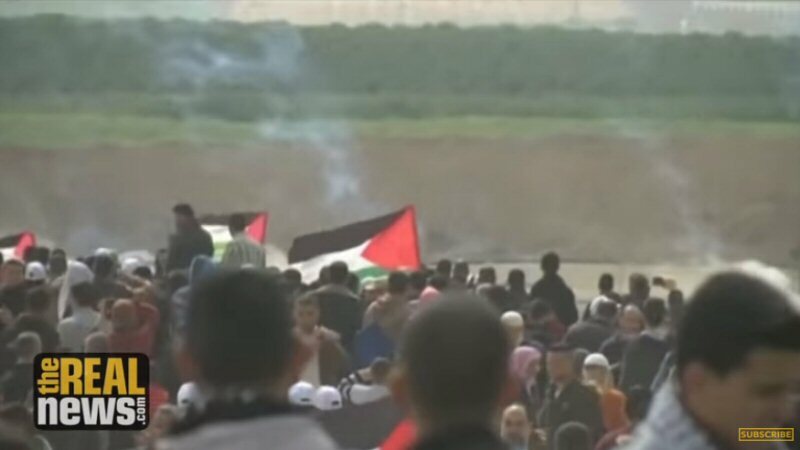 As I mentioned, the hospitals overwhelmed with the wounded, the dead, and now this fourth month of the Great March of Return. DR. BASEM NAIM: Maybe not all of your audience know that this, the Great Return March, increased an acute on top of a chronic crisis for the healthcare system. The healthcare system in Gaza, especially, suffering very much because of this blockade for more than 12 years now. The people here, because of poverty, because of unemployment, they are dependent nearly totally on the governmental healthcare system. We have here 12 hospitals, and around 55 primary care centers affiliated to the governmental system. There’s no well-developed non-governmental healthcare system. The private health sector is, is very poor, because as I said, because of the poverty and unemployment rate, and the very bad economical situation. When you have added to the chronic problems of the healthcare system this new crisis of the Great Return March, so that you will receive nearly every day hundreds of wounded people, plus many people killed, this will accelerate the problem. For example, today you are talking about only four hours electricity. There are 24 hours a day. In regular houses you might continue your normal life, or seemingly normal life, without electricity. But in a hospital or a primary healthcare centre you cannot do anything without electricity. Most of the health services are dependent on the presence of regular current, on the presence of electricity. Added to this, we are, we are talking about around 50 percent of the medicines should be, should be served or given to the people through the healthcare system, the governmental healthcare system, are not available. Fifty percent, zero stock in the Ministry of Health hospitals and primary healthcare centre. Added to this today because of the problems of electricity and other technical problems, millions of litres daily of sewage water are pumped into the sea. And you can imagine in this very hot summer, and the only chance for the people to, during vacations to go swimming, is into the sea. Millions of not treated sewage water is pumped into the sea. And you can’t, you can imagine what what this means for the public health, for the public hygiene. Most of the households here are suffering of lacking water or drinking water because of problems of electricity, and because of problems of water, which is not enough in the Gaza Strip. I think, as I said, many problems, many chronic problems-. The health system here in Gaza is suffering many chronic problems. When you talk about the people, either the patient or the staff, you have totally other problems. For example, thousands of Palestinians in Gaza who are trying to go, to leave Gaza Strip for treatment abroad in Israel and Gaza, in the West Bank, in Jordan, in Egypt. They have to wait sometimes 70 days, 80 days, to get a reply from the Israeli authority that they are allowed or not allowed to leave Gaza Strip for treatment abroad. And you can imagine what does it mean to get our answer. After 70 or 80 days, many of the patients dying while they are waiting for, for the answer. When you look to the to the staff, medical staff or health staff, many of, many of them are not able to leave Gaza Strip for any courses or any conferences, or any upgrading diplomas for years now. Added to this, most of the stuff which we are talking in the health system and the governmental system, we are talking about nearly 10000-11000 people. Most of them, they are getting 40, 30 percent of their salaries now for more than five years. AARON MATE: Dr. Naim, as you’re speaking about the struggles of Gazan healthcare workers, I’m thinking about also those who have been shot and wounded or killed, including 21-year-old Razan al-Najjar who was, came to worldwide attention when she was killed out in the field of treating wounded Palestinian protesters during the Great March of Return. And I’m wondering, now with this news that the blockade is intensifying, the blockade that was already brutal when these protests began, coupled with the fact that every single week you have Palestinians being shot with impunity by Israeli forces. Under these conditions, can these protests continue? DR. BASEM NAIM: I think the protests will continue. The message Israel is trying to send to the Gazans that you have only one choice: to die in silence. You are not allowed to raise your voice, because Gazans, all Gazans, men and women, all Palestinian factions, all political groups, all NGOs are participating in those Great Return March protests peacefully, 100 percent peacefully, trying to raise their voice against the blockade, against the oppression of Gazans under the Israeli siege. The message from the other side is you have no choice other than to die in silence and to accept this situation. And I think Gazans decided to respond clearly, peacefully, and to walk to the fence, and to show the, to show the whole world, including the Israelis as the occupying power, that we are not accepting to die in peace. We will raise our voices, we will sacrifice all what we can in order to achieve our freedom, dignity, and free life. AARON MATE: Dr. Basem Naim, the former health minister of Gaza, speaking to us from Gaza. Thank you. DR. BASEM NAIM: Thank you very much.